The Costa's Hummingbird is a rare sight on the Sunshine Coast of British Columbia...in fact, in 40 years of record-keeping it has never been seen before. But a lone male Costa's has made an appearance in Gibsons, B.C. in none other than the former mayor's yard. Barry Janyk has played host to this gorgeous hummingbird since mid-July. What's the big deal, you might ask? Well, this particular hummingbird breeds in California's Sonora desert and Arizona's Mojave desert. So he's a long way from home and he's decided to spend time in a coastal rainforest. Strange. 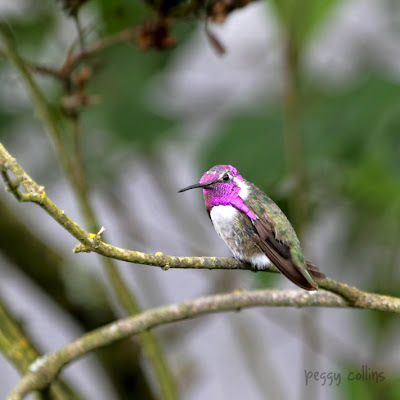 Another male Costa's hummingbird has also been spotted in a Vancouver neighbourhood. At first it was believed that these two birds were one and the same however it has since been confirmed that they are two different Costa's. Barry Janyk graciously allowed me to spend some time on his back deck photographing this tiny (3.5" long) hummer. Although small, this particular hummingbird was incredibly feisty, constantly chasing away a female Anna's hummingbird who was competing for nectar at the same feeder. He kept a fairly constant vigil so the Anna's only got in a few sips of sweet nectar. The hummingbird had a couple of favourite perches. Here he is on just one of them. It was a rare treat to be able to see this incredible hummingbird with the violet gorget and crown. I hope more of these beauties make their way to the Sunshine Coast! Absolutely amazing that you got to see AND photograph this hummer! I can totally imagine what a thrill it was. I do wonder if they are going to be more common up here now? Hope you are well and Happy Thanksgiving weekend!